I read this article and found it very interesting, thought it might be something for you. The article is called Analysing survey results using filters and is located at https://www.bangthetable.com/blog/analysing-survey-results-using-filters/. To help you analyse this data we recommend using filters to help you look for trends and patterns in your survey data. Understanding this feature is essential for anyone using surveys as part of their online engagement projects and it will greatly help you with reporting on your consultations. This article explains what survey filters are, how they work and some different ways you can use them to investigate your data. What is survey response filtering? Survey response filtering in EHQ allows you to compare survey responses based on a set of filters. These filters allow you to compare responses based on combinations of sign-up form questions and also responses to various questions within the survey itself. This feature allows you to select multiple filters based on these two areas to help you generate graphs and insights for comparison. You can use survey filtering to help you cross analyse responses by running multiple queries using “AND”, “OR” logic and comparing the results. What this means, is when you apply a single filter, “OR” logic is used within the filter and when multiple filters are combined “AND” logic is used to run the query. To do a comparison of results, you will need to run all the relevant queries and compare the differences and similarities through seperate queries. What type of queries can I make with survey result filters? 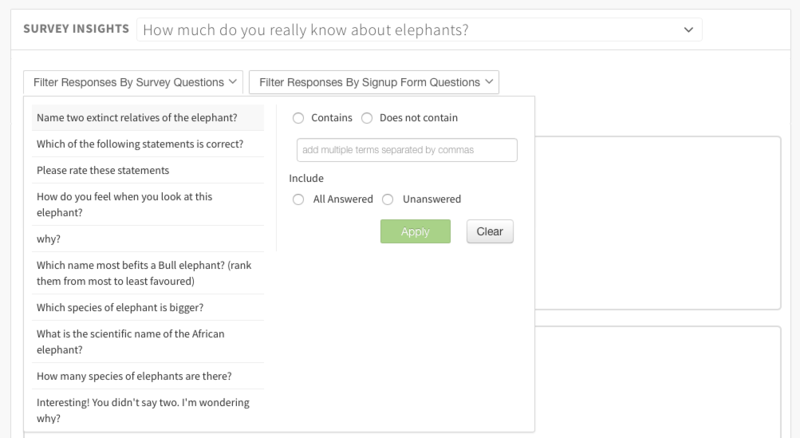 Because each filter is relevant to either a survey question or sign-up form question, the types of queries you can make with filtering will be completely dependant on how you have set up both sets of questions. Structuring your survey in a way that ensures you are capturing all of the information you need is crucial to harnessing the capability of filtering to analyse your data. In essence, you can only filter out, what you put in! Moreover, it’s worth considering that the sign-up form question filters are only going to be valuable if you have selected registered participants only when setting up your survey. This is because the data will either be incomplete or non-existent for surveys setup as anonymous. How all the Men aged 50+ who answered A to Q1, answered all other questions. How do your community members who answered B to Q2 respond to all other questions? How do community members in certain suburbs feel about your proposal? Is there a difference between Men and Womens views about your proposed designs? Is there a difference between commuters and residents views about your proposed traffic changes? What is the relationship between how satisfied your community members are and their views on your draft proposal? As you can see, the filters can help you investigate a whole range of queries. One of the best features of survey filtering is that each filter applies to all questions in your survey at the same time, meaning you only need to run the query once and you can easily compare answers to all of the questions in order to search for trends and patterns. Like all survey design, you should always work backwards from your main research question in order to setup your survey. By answering this question you are then able to extrapolate out the variables that might influence your decision making process and ultimately inform the questions you ask in your survey. Ensure that you include a combination of quantitive and qualitative questions types in order to capture different types of data when you are setting up your survey. Remember, essay and text questions are great for capturing qualitative feedback but even with survey filtering, you will still be required you to read, code and digest each response. What’s the difference between filtering survey responses and downloading the codified report? You can still use the codified reports to analyse surveys with third party software tools such as Microsoft Excel, Power Bi, BiME, SPSS and other data analysis tools. The main focus of survey response filtering in EHQ is to allow you to quickly investigate your data without having to know how to use or have access to third party software. It does exactly the same thing, we just made it quick and easy for you! To find out more read our help article.